The most common form of all chronic cutaneous variants is DLE, which can be localized or generalized, both with and without systemic manifestations of LE. Typical DLE lesions may be present at the onset of SLE in about 5%-10% of patients, and approximately 30% of patients may develop DLE lesions, usually of the generalized type, during the course of SLE (Cervera et al. 1993,Hymes and Jordon 1989,Tebbe et al. 1997). 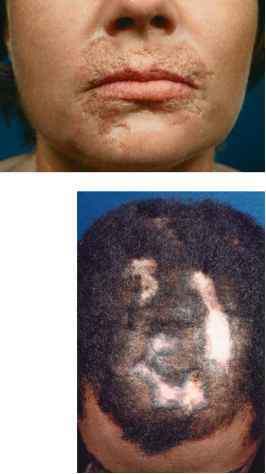 The localized form presents with sharply demarcated, erythematokeratotic, atrophic or scarring lesions, and it is often seen on the face and scalp, whereas the generalized form also involves the regions below the neck (Fabbri et al. 2003, McCau-liffe 2001, Patel and Werth 2002). DLE occurs mostly in the third to fourth decade of life; however, in two recent studies, more than 40 children with DLE ranging in age from 2 to 16 years have been described in the literature (Cherif et al. 2003, Moises-Alfaro et al. 2003). Earlier reports indicated that DLE may be more prevalent in whites than in blacks, but epidemiologic studies showed that it can affect any race (Findlay and Lups 1967, Ng et al. 2000,Tebbe and Orfanos 1997). Besides the genetic predisposition, the clinical manifestations may often be provoked or aggravated by exogenous factors, such as UV irradiation, cold, mechanical trauma, and, in rare cases, infections or drugs (Djawari 1978, Kuhn et al. 2001a,Lodin 1963).Association withHLA-B7,-B8, -Cw7, -DR2, -DR3, and -DQw1 has been described in the literature (Fischer et al. 1994, Knop et al. 1990). generally progressive, and resolution of the lesions leaves more or less evident atrophy and scarring, depending on the duration and severity of the lesions during the active phase. 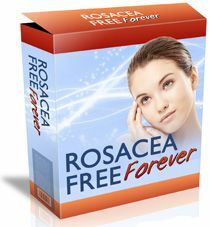 This may result in considerable mutilations, particularly when present in acral regions on the face, such as the tip of the nose and the ears, or in irreversible scarring alopecia on the scalp. A characteristic pitted, acneiform scarring is also a common feature of the perioral area (Fig. 6.8). thermore, DLE lesions occurring below the neck are most commonly found on the extensor aspects of the arms and the V-area of the neck. 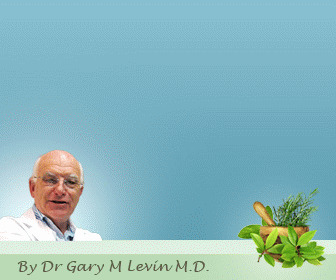 However, in the generalized form, such lesions can occur at virtually any site on the body, although the presence of DLE lesions solely below the neck is extremely uncommon. Painful erosive palmar-plantar DLE involvement can predominate in some cases, producing significant disability and presenting an especially difficult management problem (Ashinoff et al. 1988, Parrish et al. 1967). Small, follicularly oriented erythematous papules of less than 1 cm in diameter present as follicular DLE at the elbows but may occur at any other part of the body as well. These lesions may also be more common in Chinese and other Asian patients (Wong 1969). of SLE (Tan et al. 1982). Urman et al. (Urman et al. 1978) extensively studied oral ulcerations in 47 (26%) of 182 patients with SLE and noted no significant correlation between the oral ulcerations and cutaneous manifestations. Interestingly, an increased frequency of these mucosal lesions was associated with increased overall clinical activity, but no detectable correlation was found between oral ulcerations and serologic parameters. Oral, mainly buccal, manifestations are most common, with the palate, alveolar processes, and tongue less frequently involved, but nasal, conjuncti-val, and anogenital mucous membranes may also be affected at times. Individual lesions begin as painful, erythematous patches, later maturing to a chronic plaque that has a sharply marginated, irregularly scalloped white border with radiating white striae and telangiectasia (Fig. 6.11). The surface of these plaques overlying the palatal mucosa often have a well-defined meshwork of raised hyperkeratotic white strands that encircle zones of punctate erythema (Burge et al. 1989). The centers of older lesions cause atrophy and may become depressed and, occasionally, undergo painful ulceration. Sometimes mucosal DLE resembles lichen planus, with a honeycomb appearance, and squamous cell carcinoma as a long-term complication should be suspected and excluded in any case of chronic asymmetrical induration of either mucosal or cutaneous lesions (Miyagawa et al. 1996, Reichart 2003, Sherman et al. 1993, Voigtlander and Boonen 1990). 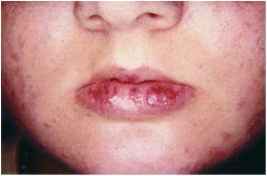 Well-defined DLE plaques also can appear on the vermillion border of the lips or can present as a diffuse cheilitis, especially on the more sun-exposed lower lip, causing considerable discomfort and disfiguration (Fig. 6.12). Mucosal lesions of the nose may result in nasal septum perforation, especially in association with generalized DLE or SLE (Bach 1980, Rahman et al. 1999). Similarly, ocular affections that are mainly located at the palpebral conjunctiva and the lower margin of the eyelids can cause permanent loss of eye lashes, ectropion, and corneal stromal keratitis (Afshari et al. 2001, Raizman and Baum 1989). Conjunctival DLE lesions begin most commonly as small areas of nondescript inflammation producing considerable disability, and as the early lesions progress, scarring becomes more evident (Frith et al. 1990, Heiligenhaus et al. 1996, Meiusi et al. 1991). plate dystrophy (Kanwar et al. 1993). The nail unit can also be impacted by other forms of CLE as well as SLE, producing red lunulae, clubbing, paronychia, pitting, leukonychia striata, and onycholysis (Costner et al. 2003). (Lehmann et al. 1990, Nived et al. 1993, Walchner et al. 1997, Wolska et al. 1989). In experimental studies, characteristic skin lesions have been induced by UV irradiation in 42% of patients with DLE. Approximately 50% of these patients reacted to both UVB and UVA irradiation, 33% to UVB only, and 14% to UVA only (Kuhn et al. 2001a). 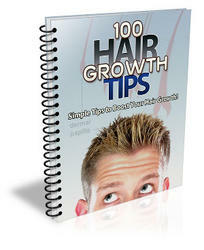 Interestingly, in more than 50% of patients, sun exposure does not seem to be related to the cause of their disease, and DLE lesions in the hair-bearing scalp, external auditory canal, or perineal areas are examples where this form of CCLE is not related to light exposure. Hypertrophic/verrucous lesions in association with CLE were first described by Bechet in 1940 (Bechet 1940); in this very rare variant, the hyperkeratosis that is usually present in DLE lesions is greatly exaggerated. Classic DLE lesions are often present elsewhere on the body, aiding in diagnosis (Callen 1985, Santa Cruz et al. 1983) and, recently, a patient with SLE and hypertrophic lesions has also been reported (Cardinali et al. 2004). However, only approximately 2% of patients with DLE show a hyperkeratotic type of lesion (Mascaro et al. 1997, Sontheimer and Provost 2003). 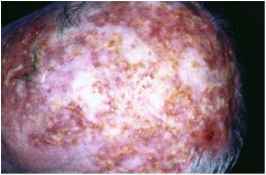 Clinically, hypertrophic DLE consists of dull, red, and indurated lesions that can appear as unique or multiple papulonodular elements covered by keratotic scale, as larger plaques covered by an adherent multilayered ostraceous horny white or yellowish material, or as regionally diffuse hyperkeratosis that looks like a chalky dust applied over the skin (Fig. 6.13) (Daldon et al. 2003). The entity "lupus erythematosus hypertrophicus et profundus" seems to represent a further very rare variant affecting the face, associated with the additional features of violaceus or dull red, indurated, rolled borders, and striking central, crateriform atrophy (Dammert 1971, Otani 1977, Winkelmann 1983). Nevertheless, the name of this entity is somewhat ambiguous because its pathology does not include a significant degree of LEP. The verrucous, indurated, hyperkeratotic plaques can occur at any site where classical DLE lesions develop, although the extensor aspects of the arms and limbs, the upper back, and the face are the most frequently areas affected (Daldon et al. 2003, Mascaro et al. 1997). Recently, conjunctival hypertrophic lesions have been reported in a patient with a history of chronic blepharoconjunctivitis (Uy et al. 1999). When the palms and soles are involved, hypertrophic DLE produces localized or partially diffuse keratoderma, up to 1- to 3-mm thick, that makes finger mobility more difficult (Rothfield 1993). Differential diagnosis must take into consideration verrucous psoriasis, hyper-keratotic lichen planus, prurigo nodularis, keratoacanthoma, and squamous cell carcinoma (Daldon et al. 2003, Perniciaro et al. 1995, Romero et al. 1977,Vinciullo 1986). Squamous cell carcinoma needs special consideration because it is well known that it can develop on chronic lesions of DLE, and until date, more than 100 cases of squa-mous cell carcinoma arising on scars of CCLE have been reported in white and African American patients (Caruso et al. 1987, De Berker et al. 1992, Sherman et al. 1993). In most cases, a male predominance, long evolution of previous CCLE lesions (mean time for development of squamous cell carcinoma over CCLE is 30.8 years), and high metastatic tendency (40%), especially when in labial location, was found (Millard and Barker 1978). Patients with hypertrophic DLE rarely develop systemic disease; however, the clinical course is characterized by chronicity and resistance to treatment (Daldon et al. 2003, Spann et al. 1988). The lesions may respond, in some cases, to local cryotherapy (with carbon dioxide or liquid nitrogen), topical glucocorticosteroid application, and systemic antimalarial drug therapy. Topical tretinoin and systemic isotretinoin therapy have also been found to be effective (Green and Piette 1987, Seiger et al. 1991). 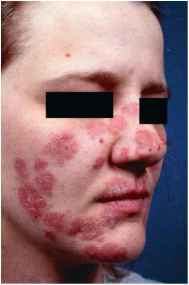 The telangiectoid variant of DLE is extremely rare, consisting of purplish plaques or blotchy reticulate telangiectasia that may develop on the face, neck, ears, dorsal aspects of the hands, breast, front of the knees, and back of the heels or sides of feet (Fig. 6.14) (Bechet and Elizabeth 1948, Mascaro et al. 1997). 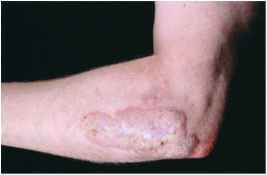 The lesions are mostly associated with further CCLE lesions or can replace active inflammation in patients with DLE developing a poikilodermatous appearance and prominent atrophic scarring. Efficient management of telangiectoid lesions can be difficult; however, argon laser treatment has been reported to yield an excellent cosmetic result without any short-term side effects (Kuhn et al. 2000d). 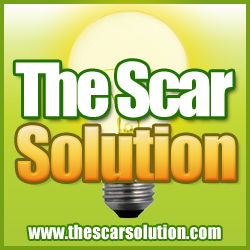 What type of scars does DLE leave? When was Discoid Lupus Erythematosus first described? Can one lesion near elbow be DLE? Can discoid lupus 40% permanent remission? How long does it take to get rid of.plaques of discoid lupus on plaqurnil?